17a. 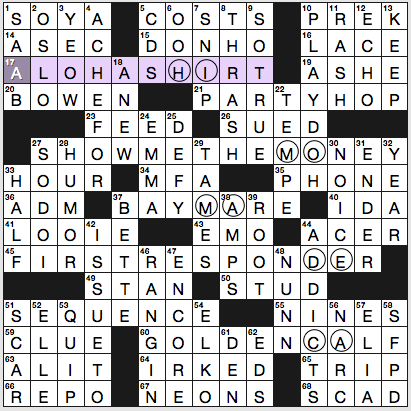 [Article of tropical apparel … whose start is a state nickname for the state indicated by the circled squares], ALOHA SHIRT. The Aloha State, Hawaii. 27a. [Catchphrase shouted in “Jerry Maguire” … whose start is a state nickname for the state indicated by the circled squares], SHOW ME THE MONEY. The Show Me State, Missouri. 37a. [Secretariat’s mother, for one … whose start is a state nickname for the state indicated by the circled squares], BAY MARE. The Bay State, Massachusetts. “Bay mare” is not a familiar phrase to those of us outside of horsey circles. 45a. [Emergency worker … whose start is a state nickname for the state indicated by the circled squares], FIRST RESPONDER. The First State, Delaware. 60a. [Biblical idol … whose start is a state nickname for the state indicated by the circled squares], GOLDEN CALF. The Golden State, California. A fresh theme approach is always nice to see early in the week, though there’s also a place for riffs and recyclings of basic themes on a Monday. I did feel discouraged by 1-Across being SOYA, which is a form of the word used by very few Americans. ACER as a person, ALIT, SO DO I, ELKO, NO ICE, and ELIA all seem a bit tough for newer solvers, too. 4.25 stars for the theme, 2.75 stars for the fill. Circumstantial evidence indicates that Charlie Oldham is another Mike Shenk pseudonym. It anagrams to Michael Harold, which I’m assuming includes his middle name. I wonder how he decides which pseudonym to use for which puzzle. “Charlie Oldham” has given us a very clever puzzle in the past, but this one’s pretty basic. We have three phrases which end in a plural form of the three main verb tenses. 20a [Problems for some job applicants] CRIMINAL PASTS. This would work much better in the singular form. 38a [They’re often purchased from a registry] WEDDING PRESENTS. This could go singular or plural, but in plural form it’s a convenient grid-spanner. Also, this is the only one where the tense word changes meaning. 54a [Mercantile exchange offerings] ENERGY FUTURES. This needs to be in plural form, so it drove the others to be plural. I didn’t bother looking at the theme during the solve; it all went pretty quickly and smoothly. As I said the theme is pretty basic, so most of the fun is in the non-theme fill. Favorites include earwormy EDELWEISS (34d, [“The Sound of Music” song about an Alpine flower]) as well as PAINT GUNS and SEE DOUBLE. Other fun long fill includes LAST NAME, IN A SECOND, DETENTES, HUMMER, and GAUCHO. Check out those middle Acrosses: RAGERS, QUIETS, SHRIEK and TOP DOG. Very nice. Today’s LAT starts with a cross-reference at 1A. I do not like this. 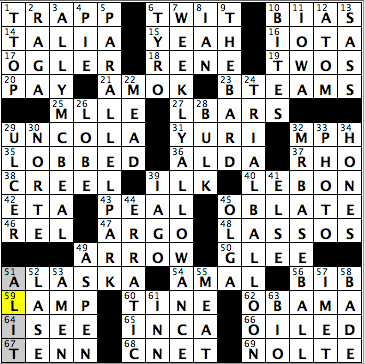 I particularly do not like it when there’s no info in the clue – it says [See 16-Across.] That’s just an unsatisfying way to start a puzzle, especially on Monday. 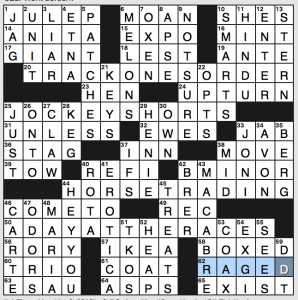 Turns out the 1A-16A cross-reference is relevant to the theme, and I suppose they might have been concerned about tipping their hand too early. Still. Me no likey. 20a [Keep tabs on a shipment] = TRACK ONES ORDER. 25a [Some briefs] = JOCKEY SHORTS. 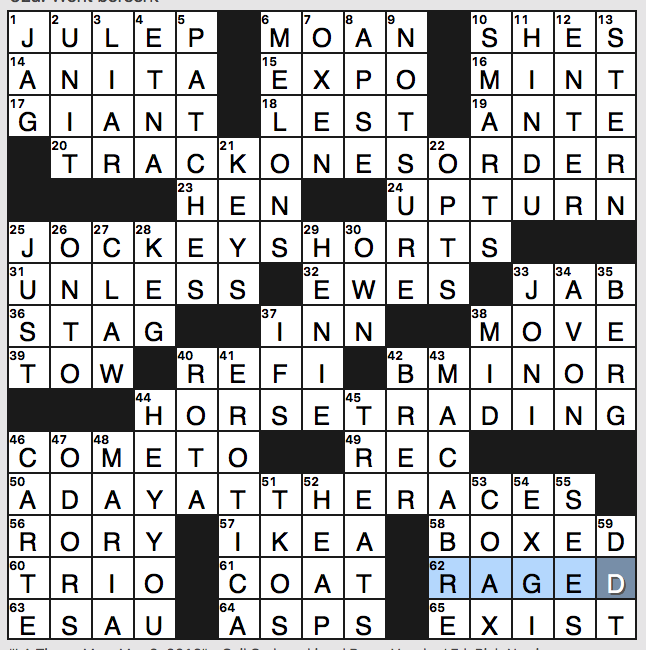 50a [1937 Marx Brothers film…and, based on words that begin 20, 25 and 44-Across, this puzzle’s title] = A DAY AT THE RACES. There’s nothing wrong with the theme – all three themers are solid and it hangs together well. It’s a perfectly good Monday theme. I think it’s the MINT JULEP that bothers me, both because of the 1A cross-reference and the fact that it ties this to the Kentucky Derby two days after the race was run. 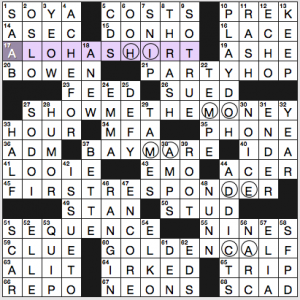 OXEN only exist in crosswords as part of a team. They’re not the only draft animal that is yoked. Free the oxen! [Membership list] at 40A is ROTA, which confused me – I thought it was ROLL. I can never remember how to spell Sonja HENIE last name. Where does the I go? I never know for sure. Love the Swedish meatballs at IKEA (57a.) Also love the chocolate. Yum. Not my favorite Monday puzzle, as you’ve probably realized. What I didn’t know before I did this puzzle: that I would get so annoyed about a cross-reference. Good day, everybody! Hope you’re having a great day, and the weather currently here in New York is definitely cooperating. 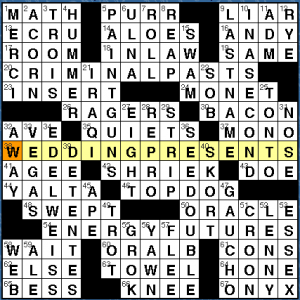 We have a very well executed crossword theme for today, as Ms. Donna S. Levin’s grid includes five answers (all going down) in which the letters “ALL” are symmetrically placed going downward from left to right. Even better, the last theme entry was a sports-ish one. Ally McBeal was the first entry I filled in in the entire grid, and from there, knew the themes all had to have “all” embedded within the answer. Literally went to the rest of the theme entries to see how much I could fill in, and was able to get parallel park, Mr. Baseball and the “allowance” portion of the middle theme entry. The rest of the fill was more than solid, but the theme, and its execution, is what absolutely stands out. Oh, and LEBON, as Duran Duran is just an awesome group (40A: [Duran Duran frontman Simon]). I’m pretty good with ad slogans, so UNCOLA was a gimme (29A: [7UP’s tagline, with “the”]). I absolutely hope that either the constructor and/or anyone else solving the grid saw the humor in having TENN (67A: [Home state of the Volunteers (abbr.)]) and I SEE stacked one on top of the other (64A: [“Got it”]). “Are you from Tennessee? Because you’re the only ’10’ I see!” Number of times I’ve used that pick-up line? More than zero. “Sports will make you smarter” moment of the day: TRAPP (1A: [_____ Family Singers (group whose origins were portrayed in “The Sound of Music”]) – For those who love their European soccer, this one’s for you. German international goalkeeper Kevin TRAPP is the current No. 1 goalkeeper for French Ligue 1 side Paris Saint-Germain, who have won the French league championship for a fourth year running in 2015-16. This is Trapp’s first year as the keeper in Paris, as he joined the team from German domestic side Eintracht Frankfurt this past summer. Thank you all for the time, and I’ll see you tomorrow! This entry was posted in Daily Puzzles and tagged Bruce Venzke, Charlie Oldham, Dan Schoenholz, Donna S. Levin, Gail Grabowski, Mike Shenk. Bookmark the permalink. I give Amy’s write-up 5 stars. It’s pointless as I know already the only ratings we’d ever receive are all 5 stars. I wouldn’t be so sure. Did you read Harry’s post below? Addendum to ADDICTS: A personal essay by a Facebook friend who lost a friend to an overdose last week. Such a lovely little song. One comment on today’s LAT review…get over it! It was a good puzzle for a Monday.